Hepatitis C, a liver disease that results from infection with the hepatitis C virus, can range in severity from a mild illness lasting a few weeks to a serious, lifelong illness. The infection is often asymptomatic, but chronic infection can lead to liver diseases, which can become apparent after many years. Several new options are emerging that could change the way hepatitis C is treated. Industry pulse: Which new treatment offers the most promise for hepatitis C? APhA is offering an opportunity for you to participate in a unique and innovative project designed to help you develop a plan for expanding your pneumococcal immunization services. The project is being funded by an unrestricted educational grant from Pfizer Medical Education group. RxVaccinate is an educational project designed to provide pharmacists with the tools, resources and training needed to initiate community-specific strategies to increase pneumococcal vaccination rates. Application to participate in the project is open to any pharmacy with at least one staff member who has been trained to deliver immunizations through APhA's nationally recognized certificate training program, Pharmacy-Based Immunization Delivery, and are authorized by state regulations to administer pneumococcal immunizations. Coyote Crisis Collaborative, a disaster preparedness support nonprofit funded primarily by ADHS, is looking for subject matter experts to offer guidance to the Health Emergency Response Coalition members to the central region of Arizona encompassing Maricopa, Pinal and Gila counties. The group is comprised of hospital emergency managers as well as others from allied health organizations, municipal representatives, EMS, etc. Topics include evacuation and the roles of allied health organizations in addressing mass casualty incidents. If you are interested in participating in this effort, please contact Kelly Ridgway, AzPA CEO. Tiny Bryanna beats the odds, but her harrowing case illustrates whooping cough's grave danger for infants. The family shares the story to highlight grave risks of respiratory illness. 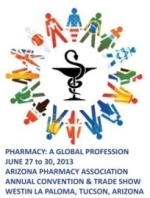 Just two weeks until the 2013 AzPA Annual Convention. Are you registered? Offering flu shots at elementary schools could reduce the number of flu cases and deaths among children, a new study suggests. Vaccination is the most effective way to protect children aged 6 months and older against seasonal flu, but vaccination rates among American children are low. Only about 40 percent of children received a 2012-2013 flu vaccine, according to the U.S. Centers for Disease Control and Prevention. Looking for similar articles? Search here, keyword CHILDHOOD VACCINATIONS. The U.S. Court of Appeals for the Second Circuit ordered June 5 that two-dose emergency contraceptive products must be made available OTC for all ages, at least until the court rules on an appeal by the Obama administration. Recently, one of the raging news stories concerned the problems cropping up over compounded drugs, specifically steroids, and contaminated doses reaching and poisoning patients. With the Affordable Care Act now being phased into effect, the restrictions on pharmacies and doctor's ability to prescribe drugs will continue to become more onerous. The latest bit of legislation in the war on Oxycontin for example, is making its way through the Oklahoma government, where it will be flat-out illegal to write a prescription for hydrocodone. Dr. Mei Liu, a computer scientist, has recently shown in a new study that electronic medical records can validate previously reported adverse drug reactions and report new ones. The study examined the use of retrospective medication orders and inpatient laboratory results documented in the medical records to identify adverse reactions. Twelve years of data from Vanderbilt University Medical Center were studied by Liu and a research team. The researchers correlated abnormal laboratory results with specific drug administrations by comparing the outcomes of a drug-exposed group and a matched unexposed group. Five thousand Maryland state employees will be able to receive medication therapy management services provided by specially trained pharmacists through a new 14-month pilot project of the Maryland P3 Program. Until now, the program has been available primarily to patients at private self-insured companies. More children are being exposed to prescription drugs unintentionally due to an increase in the number of drugs prescribed to adults, according to results of a study published in the July issue of Pediatrics. Although public interventions regarding safe medicine storage have reduced the number of overall deaths caused by medication poisonings in children, the number of children visiting emergency rooms as a result of medication ingestion is increasing. A common genetic variation that can impact the therapeutic dose of the blood-thinning drug warfarin among African-Americans has been found, according to a new report in The Lancet. The finding revealed that people of African ancestry who have the rs12777823 variant require a notably lower dose of warfarin to achieve all the advantages, compared to those without this single-nucleotide polymorphism. Almost 30 percent of patients thought to have gastroesophageal reflux disease may be receiving long-term proton pump inhibitors unnecessarily, according to a new study presented at the 2013 Digestive Disease Week meeting. Conducting a pH monitoring study immediately following an initial eight-week trial of PPI treatment could identify many patients who do not need treatment with PPIs and could save thousands of dollars in unnecessary healthcare spending, researchers reported. The diabetes drug rosiglitazone should stay on the market, and the current restrictions on its prescribing should be eased but not lifted entirely, according to the majority vote of a joint advisory panel to the FDA. Life is about risk and rewards, balancing the positive with the negative and taking the good with the bad. Advances in healthcare technology free up pharmacists' time by automating certain tasks so they can dedicate more time to patients. In a study of elderly Australians with chronic obstructive pulmonary disease and newly diagnosed diabetes, those who received high-dose corticosteroids had an increased risk of being hospitalized for a diabetes-related complication within a year. The aim of this study is to determine the content of five important emergency medical services drugs after being stored at the recommended refrigerated temperature, room temperature or in an emergency physician transport vehicle operating under real-world working conditions. Diabetes and coronary disease are common comorbidities, but the clinical community continues to debate the best management strategy for patients with both conditions. Diabetes is associated with an increased risk of death or heart failure within 30 days of an acute coronary syndrome event. Several observational studies have suggested that diabetes patients treated with sulfonylureas may be at elevated risk of cardiovascular events. The proposed mechanism is the adenosine triphosphate-sensitive potassium channel.